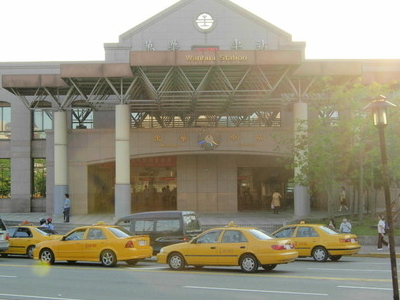 Wanhua Station (Chinese: 萬華車站; pinyin: Wànhuá Chēzhàn) is a Taiwan Railway Administration station located in Wanhua District, Taipei, Taiwan. The station is divided into east and west buildings. The station entrance, lobby, and ticket counters are located in the west building. The station exit, parcel center, and offices are located in the east building. The station is equipped with one island platform and one side platform, both underground. Although not constructed yet, the station is built with a foundation for a twenty-story building.The station allows payment using the EasyCard for stations between Zhongli and Keelung, as well as between Ruifang and Hsinchu. Here's the our members favorite photos of "Railway Stations near Wanhua". Upload your photo of Wanhua Station!